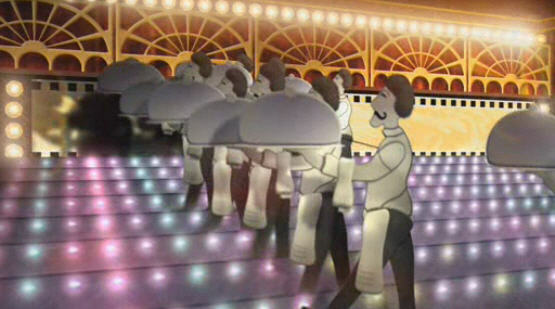 AE or 3D looks at a superb animation (44MB download) by Chris Zwar, who has in the past been a CreativeCow contributor. In terms of what was AE 3D- the answer is practically everything. The curtains drawing back at the beginning were a piece of stock footage but everything else was done inside AE. Even the curtains which don’t draw back are solids with fractal noise. The bouncing balls were CC spheres (with expressions to squash and bounce them appropriately), the “gun” at the end was a CC cylinder, the wooden blocks which form the rings and the “Challenge” pattern were just 3D solids arranged by expressions, etc etc. 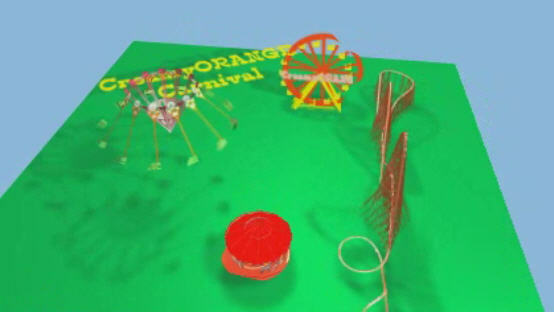 CreamyOrange – Extreme 3D explores a similar fairground theme. Putting together a ferris wheel, roller coaster and spinny chair thing using AE, Photoshop and Illustrator. The final piece was comprised of 7000 3D layers, and seems to have triggered a rendering bug in AE (which Steve has comitted to investigating). It’s great to see artists and designers pushing the limits of software, but even more refreshing is that the developers (and product managers) are blogging publicly to acknowledge the work these people are creating and troubles they’re encountering.